Buyers from the big department and chain stores tell us that pink is for girls, with purple running a close second. And often that is all they will stock. I remember the frustration when a buyer handed us a colour palette to work with of their forecasted "hot colours of the season" and they were all pink. Or purple. Apparently red, or green, or yellow didn't sell. Don't even think about brown or orange and never, ever blue. And then a wander through the boys department! Navy, black, khaki... blue in most shades or sometimes beige or grey. Seldom any real colour. And most certainly never pink. I remember the bagging Huz copped for wearing a pink shirt to our wedding... Imagine if my owlets had been boys!! My owlets seldom leave the house wearing pink, although it may be one of the colours used somewhere in the mix. The two bigger owlets have been through a pink phase each. I've not restricted their access to the colour, but always made sure other colours are represented in their wardrobes. It seems that the pink phase happens at around 3 or 4 years old when they are starting to understand boys and girls and the gender roles society places on them. But it also happens at a time where they are reaching for independence. Pink is a very nurturing colour, the colour of love and warmth. It's quite natural that they would be attracted to it. I've noticed several boys around this age finding an affinity for pink too (whether it is encouraged or not). It makes sense. Which is why I find it so sad that these restrictions are placed on colours. Especially at such a young age, from birth. To me, colour can be such a nurturing thing. I've found myself drawn to colours at times of need. As a mother, green is what brings calm to my days. Red is for strength. Orange got me through a miscarriage or two and felt very healing. My girls love yellow for sunny days and chocolate brown when they are being detectives. Colour always should be playful and nurturing and free. Ooh and PPS: Thank goodness for handmade!! I also feel strongly about this topic. I'm so tired of all the pink on offering for my baby daughter. 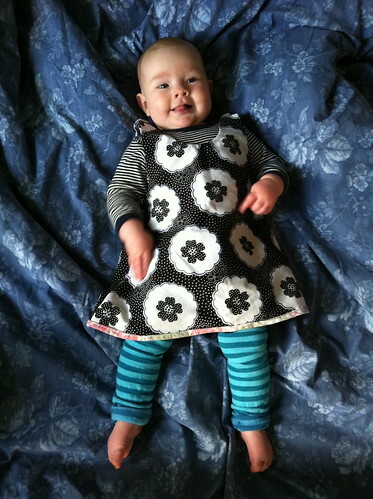 Most of her clothes are op shop buys or handmade and I'm drawn towards blue, yellow, red and green. All beautiful on babies. Sometimes I even buy clothes with more of a boyish print if I really like them. Your little girl looks beautiful by the way and I get the same comments when my daughter wears blue or red. People are blinded by colour and don't see that it may be a dress or have a floral print. We had the same thing with my middle child.She had an adorable little suit of yellow leggins and a navy blue top...and was always called he!Mind you she gets that now and she is 8, with long hair and plaits...but because she dosnt like girls clothing she is labled he so much.I dont think she minds though.Why do we colourize our kids?Clothing should be comfortable not pink or blue depending on our genes! (And some of those "pretty" dresses for girls are just darn scratchy, as are sequins on them! ).And if you cant tell the gender of a child whats wrong with something like "what a beautiful baby" you cant get the baby bit wrong now can you! People often mistake my son for a girl, even though he's big and loud and not at all feminine. I wonder if it's because he wears his sisters hand me downs sometimes lol. I agree with you on the colour issue too. Some girls are drawn to colours other than pink. Actually at Ina's kinder recently I did a little straw poll and asked all the girls at the table what their favourite colour was. There was a yellow (that'd be my girl), purple, blue, red and one girl who said 'all the colours in the rainbow'. None of them said pink. Your tiny one is looking super duper cute. Five months already! Well, you know K always gets mistaken for a girl, no matter what he wears! He's been calle 'she' in everything from a batman t-shirt to a purple hoodie! They just look at his hair! His favourite colour changes daily - yesterday it was green (he has green toe-nails at the moment, btw! ), today it's yellow! I have the same problem shopping for him in stores, i can't stand all the blue stuff with trucks on it! If we ever find anything different, i'll pay for it - especially pants, and i shop online a lot - i soooo wish i was more handy with a sewing machine though! She's beautiful! I too get annoyed with all the colour associations people make for boys and girls. I think it's great that you're encouraging the girls to wear lots of colours! i hate to say it but i was called boy until i was about 11. traumatized. even though i hate the color pink, like hate hate, not just dislike, i went with a lot of pink for my DD. i didn't want people thinking she was a boy. well guess what, people told me how cute my 'boy' was all the time! yes, even in the pink dress with the pink hat and the pink sandals! now that she is older and she has a baby bro, our palate has changed considerably, thank god! i am happy to report that tho she still loves the color, she will pick out many different colors to wear all at the same time!